The Coachmen Catalina line of travel trailers have been a trusted name in the RV industry for many years. Quality, value, eye appeal and versatility have made the Catalina a popular choice for a wide variety of RV camping enthusaists. Families, retirees and outdoor adventurers have and can continue to rely on Coachmen Catalina Travel Trailers to provide a comfortable camping experience at an affordable price point. 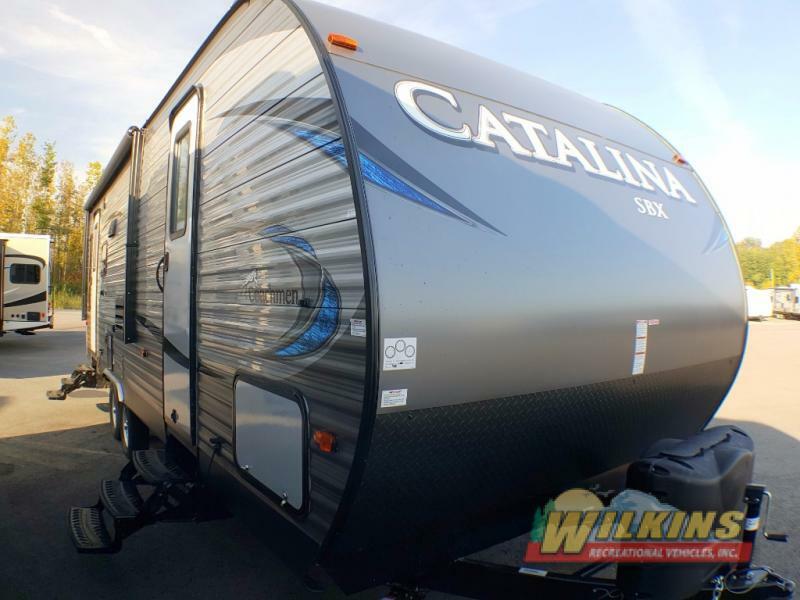 Here, we’ll take a look at the three brands of Catalina RVs for Sale at Wilkins RV, the Catalina Legacy, Catalina SBX and Catalina Trail Blazer. 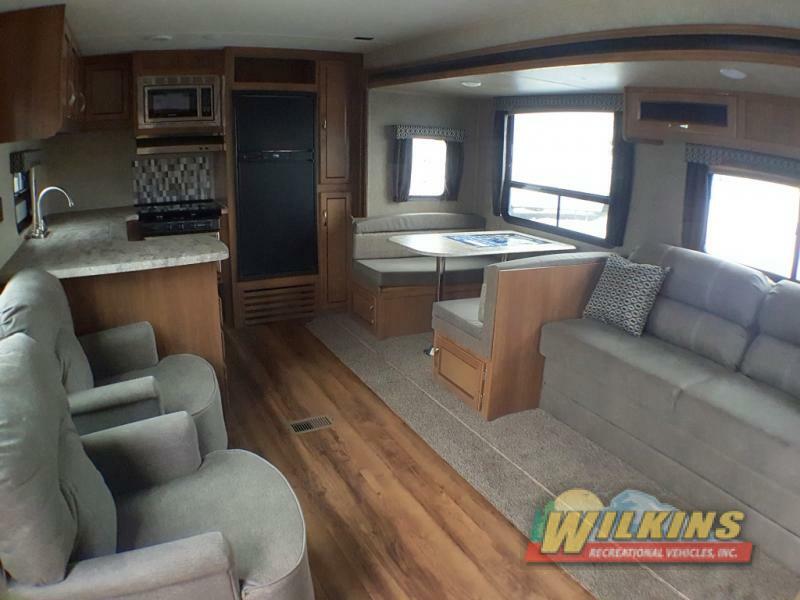 With such a large variety of models available in a wide range of sizes, floorplans and features, there is sure to be a Coachmen Catalina with your name on it. Starting with the most well equipped of the three choices, all Catalina Legacy Edition Models feature a long list of amenities designed that provide a well rounded, residential RV camping experience. There are 19 floorplans to choose from that have one, two, or three slide outs for added interior space, depending on your specific travel needs. From multiple bunkhouse configurations to rear kitchen, rear living and rear bathroom layouts, your ideal layout is waiting. 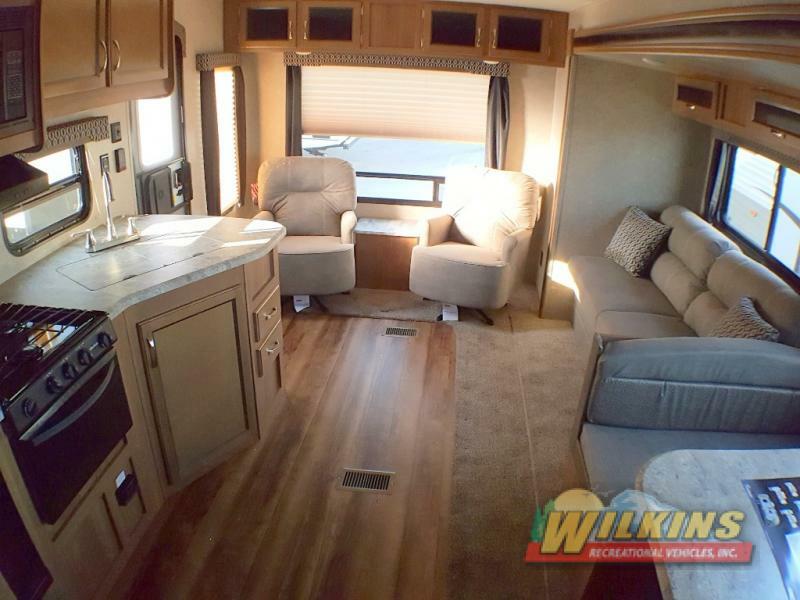 With standard options such as residential in-floor ducted heat, an electric fireplace (depending on the model), a mosaic tile backsplash in the kitchen, flush mount lockable baggage doors, remote operated power LED awning and more, the Catalina Legacy Edition is a fantastic choice for new and experienced RVers alike. The Catalina SBX Model is available in 12 different floorplans with or without slide out rooms. Catalina SBX models range in dry towing weights between 4600 pounds to 7750 pounds, making the SBX an easy to tow option for campers without a heavy duty truck. The Catalina SBX is also equipped with many sought after features such as in-floor ducted heat, pleated night shades, a rear vision camera prep, and power awning. This value packed camper is a go-to choice for campers looking for affordable outdoor fun! Last, but definitely not least is the Catalina Trail Blazer Toy Hauler. 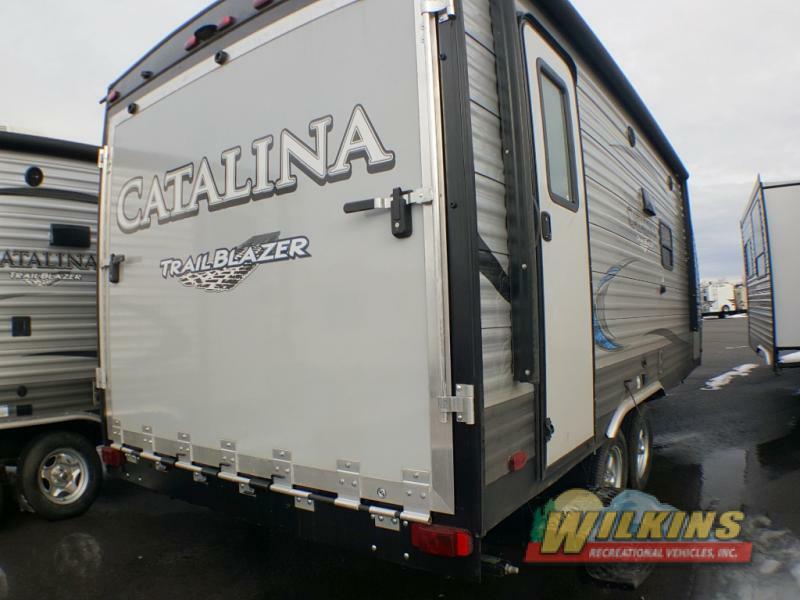 With the Trail Blazer, you get all the quality comfort the Catalina brand has to offer in the convenience of a rear ramp travel trailer toy hauler layout. If your camping adventures include a motorbike, kayak, or other bulky outdoor gear, the Catalina Trail Blazer is the right choice for you. 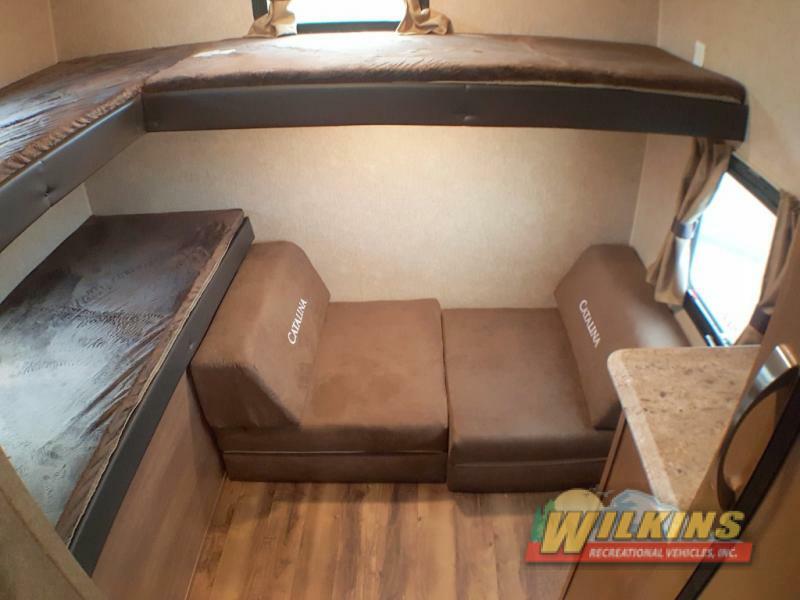 To take a tour of the Coachmen Catalina RVs available at Wilkins RV, Contact Us or visit us at one of our locations in Bath, Syracuse, Churchville or Victor, NY. We’ll help you find just the right Catalina to make your next vacation a dream come true!